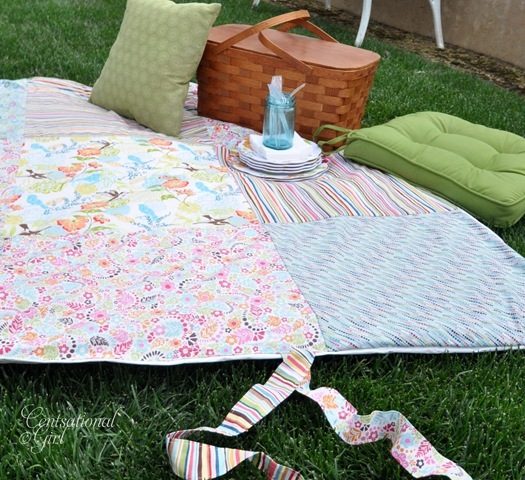 I WILL MAKE THIS CENTSATIONAL GIRL PICNIC BLANKET! I wanted to……I really did……. But I wanted mine a little different. I was making it as a gift for Romeo’s daughter and I was using old Ralph Lauren shirts that her dad had “outgrown” , for my fabric squares. Because I wanted to use the little “polo”, my squares were smaller, due to the way I had to cut this portion of the shirt out. I had old seersucker jackets and pants that he had plus a few Polo’s. I opened the vinyl tablecloth and could NOT believe how big it looked on my kitchen floor. I went back to Centsational Girls tutorial to make sure she used that big of a vinyl tablecloth. I began placing my teensy, tiny, little, wittle, fabric squares on my cloth……. Then I really wanted to puke…..
Because I realized that I would have to cut 700 million more. I also realized how smart she was by using 20×20 squares and how stupid I was to cut mine so small, just to have a stupid, dumb, doofus headed,Â little Ralph Lauren pony pop up here and there. I pulled out my NEW/USED sewing machine that I got off of Craigslist after my Miss Mustard Seed one was unfixable. The fact that the man I bought it from, didn’t have the manual didn’t intimidate ME….. I mean, I used my moms antique one growing up….how hard could this one be? He also sold sewing machines…gave me his card….saidÂ perfect working order and if any problems to bring back…..pretty good for cheap on Craigslist. I wanted this post to be super impressive, so before I started sewing, I wanted to make sure I did things the right way this time. Just like Centsational Girl did. Of course…… my eyes rolled back in my head when it started and I about went into a coma. My mind could NOT grasp the details. But I watched it again….three times……and felt pretty good about understanding it. But here is where I think I should speed up my tutorial a bit. All of the thread was coming off of the spool like crazy! I wasn’t even sure if it was supposed to be laying down but I felt like I was going to break it standing it up. The thread felt really thick too….maybe I got the wrong kind? It was with the quilting stuff??? Then the machine kept locking up……and an alarm was going off and all the lights would stay lit. Then after I hand rolled all of the bobbin thread back in it….because I wasn’t sure how to put thread on the bobbin…….. and I tried to follow that little photo on what to do with the thread coming out of the bobbin….I think I did it right? Where the HA YECK did all of this thread come from? I had just stinking started! This was to be “my time to shine”! “My time” to start posting these projects like crazy! “My time” to shine was fading fast. And my blood pressure was rising quickly. I have seen people do this with puzzles so I figured best way to transport…..
Yes….I transported it….I know….I’m a loser. And I took it to my ever, faithful, seamstress. The one that finished these when I was a FAIL at the sewing part…. And these when I about had a nervous breakdown on my Miss Mustard Seed Panels. #1. Keep a blood pressure cuff ready to know when it may be time to “wrap up” a project. #2. I am going to find a sewing class. #3. The Lord forgives and forgets promises that we may not be able to keep. As God is my witness, I am going to sew my Roman Shades! I’m serious….I am NOT a quitter. I have got to beat this! Anyone live close to the south and want to teach me how to sew? Thought we were friends people? I will show you my finished product when Miss Sarah completes it. I’m not going to tell Romeo’s daughter that I didn’t finish it…….so neither do any of you…..got it? Let’s just keep this secret here on this blog….. on the internet…… in private. She doesn’t read it…so we should be safe. Now Sarah just chuckles when I walk in her door…..what kind of respect is that? I promised her I wouldn’t start my Roman Shades until she finished this picnic blanket. Man….I must really worry her. That made me sad too. At least she is merciful on me with charges. People, I have got to be able to do those Roman Shades on my own! I want to impress her! I want to impress you! I want “MY SHINING MOMENT”! Got any tips on them? I beg of you people! I mean this happens to everyone….right? Can some of you tell what is going on by just looking at it? I will call Ms. Paparazzi and promise her wine to help me……might take wine and chocolate……. and promising to babysit her three children overnight…..and helping her de-clutter…. Dang….ya’ll have less strings attached….got any tips….know where I can get the manual for this? I love you guys! You’re always there when I need you…………. ← This is the only time, this has made sense……. Oh, and I meant to say that the problem you might be having in that last picture might be because your machine isn’t threaded properly – or at least that has been my experience when that happens to me. If you lived closer we could totally get our sew on together. I am guessing that you can find a manual online… & if I was doing that project, I would not use quilting thread in the machine… just regular cotton or poly thread… & possibly it is threaded wrong…??? Hope this helps!! :))))))))) Look… I think my smiley face needs a turtle neck!!! ONLY KIDDING!!! Love ya! Two things….first, take your machine in to have it cleaned and checked. I found a sewing machine repair shop in my area by using the very old-fashioned phone-book. Who knows what happened to the machine before you got it??? And second, you need something that keeps the thread on the spindle. My machine came with little felt pieces that slide over the spindle and up against the spool of thread so it spins but doesn’t wobble. If neither of those things help, be extra sweet and kind to your seamstress and go have a glass of wine…. Ok, dear, I would soo give you sewing lessons. If I can teach a bunch of 7 year olds I can teach anyone! Also, looks like you have the wrong thread. Just because you are making a quilt, doesnt mean you use quilting thread. That is usually used for hand sewing. Does it feel waxy? I use coats and Clark white or cream when piecing my quilts. I think it is 40weight. that is a good thread for piecing and quilting by machine. I would recommend trying to find a manual for your machine to show you how to thread it and wind the bobbin. You can get that mess you had at the bottom when your bobbin is not wound properly or your tension is off. You may need it serviced. And remember BREATH! it is frustrating and you may want to bang your head on a table or throw the machine into a highway and let an 18 wheeler take care of it. But the more you read your manual and get use to your machine ( because not all machines are the same) you wont have to use that blood pressure cuff. You crack me up. I will teach you to sew. When do you want me to come over? I will at least teach you how to thread a bobbin 😉 Of course I will have to teach you how to do it on my machine, so I don’t know it that will help much. I LOVE the idea of this project. three words: hot. glue. gun. Rebecca,,,LOL!!! I donâ€™t know where to start!!! I wish I lived in your area. Iâ€™m sure teaching you to sew would be the most fun. They say we all have 15 minutes of fame. Iâ€™m sorry but yours will not be in the sewing department. Are your blinds going to be inside mount? If they are going to be inside mount your windows need to be square! Not just kinda square! But square. If they are not the shades will not raise and lower correct. They will hang up on the sides and hang uneven. You only want to have Â¼ inch space between the fabric and the window frame! If you leave more than that they will not look good. In short donate the sewing machine and CALL your seamstress! P.S. You could come down to the beach and we could sit on the porch and talk about sewing while we drink wine!! I’m out of glue sticks. Iâ€™m sure my husband will TOTALLY understand my reason for moving! Iâ€™m going to have to think about how to present this to him. Iâ€™m sure it will start out with something like this. Well remember I am in NC… there is also the option of stopping by your local quilt shop to take some classes. That stinks when the dang machine doesn’t work…..I’ve been sewing all my life and the machine has to be threaded correctly and you have to have the right thread, not quilting thread. It’s really quite simple. I wish I lived near you I would run over and get you started cuz it really is important to have the machine threaded right. I did read you have someone coming to your rescue so good for you. Don’t give up! The last picture is what happens to me every time I use a sewing machine. I can hand stitch like crazy, but get me anywhere near a machine and I think they know how much I hate them. The sad part, my mother was a seamstress extraordinaire and I can’t get the freaky machines to work. Good luck Darlin. I’m pulling for ya!